Mystery Fest Key West has announced a call for entries for the 2019 Whodunit Mystery Writing Competition. The winner will claim a book-publishing contract with Absolutely Amazing eBooks, free Mystery Fest Key West 2019 registration, airfare, hotel accommodations for two nights and a Whodunit Award trophy to be presented at the June, 2019 Mystery Fest Key West. Key West, FL, March 22, 2019 --(PR.com)-- Do you have a finished, but unpublished, mystery genre manuscript? Mystery Fest Key West has announced a call for entries for the 2019 Whodunit Mystery Writing Competition. 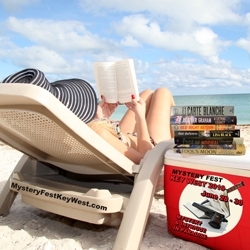 The winner will claim a book-publishing contract with Absolutely Amazing eBooks, free Mystery Fest Key West 2019 registration, airfare, hotel accommodations for two nights and a Whodunit Award trophy to be presented at the 6th Annual Mystery Fest Key West, set for June 28-30 in Key West, Florida. Sponsored by Absolutely Amazing eBooks, candidates wishing to compete are invited to submit the first three pages (maximum 750 words) of a finished, but unpublished manuscript to whodunitaward@mysteryfestkeywest.com no later than April 15, 2019. There is no fee to enter, finalists will be notified by May 1, and will have until May 10 to submit full manuscripts.